No matter what the groundhog says there is likely still cold weather ahead for the Michigan area. While most of us will be tucked up warm and cozy inside enjoying a warm cup of coffee or hot cocoa the roof on our homes will be fighting the battle against the cold weather. The roof on your home is the first line of defense against the weather and over time, cold weather can cause damage to the roof. Understanding how threats from cold weather can affect your home’s roof can help you better prevent damage to your home’s roof. 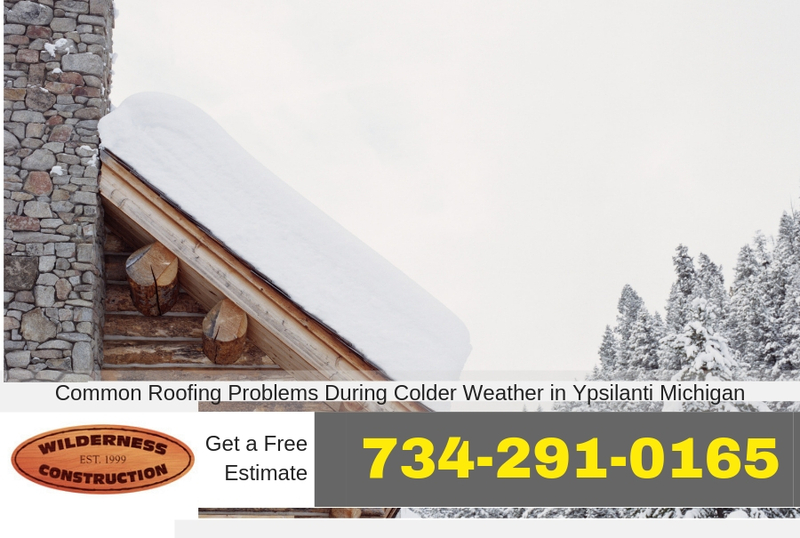 Here at Ypsilanti Roofing Company we’ve outlined some of the more common roofing problems that happen more frequently in colder weather such as the weather we’ve been having lately in Ypsilanti Michigan. While small roofing problems may not seem like much of a problem they can quickly lead to all sorts of problems. A roof leak can cause thousands of dollars in damages to the interior of the home after it leaks. Neglecting your home’s roof can lead to these roof leaks. There are also problems that happen during winter and colder weather months that you should be aware of. The following items are problems that you may experience during colder weather in your Ypsilanti Michigan home. I would like to mention that noticing any of these problems means you need the help of a qualified roofing contractor to make repairs to the roof. Also, you should not go on the roof at any time. Falls from the roof are common and inspecting the roof should only be done by properly trained and qualified professionals. At Ypsilanti Roofing Company we can inspect your roof if you think there may be a problem. Don’t take chances by going on your home’s roof as it is extremely dangerous especially during cold weather. One problem that many people never think about is the condensation that can build up in the attic of the home. This usually happens because of the warmer air from heating the home rises into the attic area and contacts the colder air and surfaces. Roofing ventilation is used to combat this problem but sometimes the vents can be blocked by wildlife, snow, or ice. If you notice condensation in your attic or blocked vents on your home be sure to get the roof inspected. One of the biggest problems that shingle roofing has is the wind. Winds can get under shingle tabs and bend them causing them to break. This type of damage from the wind can happen at any time of the year but generally during colder weather the shingles will not bend as much and become more brittle which makes them easily broken. Also the age of the shingles will make them more susceptible to wind damage as well. With ice and snow falling regularly the tree branches can become weighted and fall. If you have trees with limbs that overhand your roof be sure to keep an eye out for them falling. Sometimes they also fall down to the roof and scrape the shingles which can also lead to roof damage and the shingles failing prematurely. While icicles look great they can be dangerous for people and pets to walk under. They also add weight to the gutters of your home or the eaves themselves. Large icicles forming puts more of a strain on the edge of the roof and should be inspected. 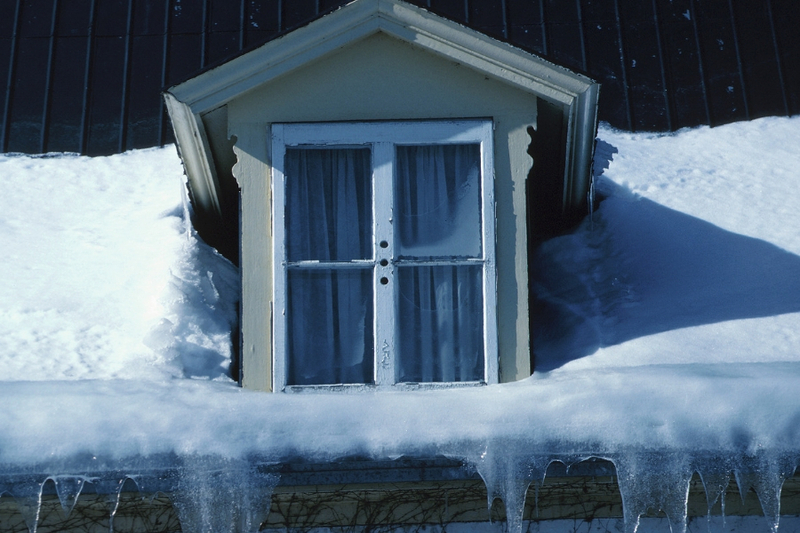 Another common problem that may develop on your home’s roof is a roof ice dam. Having roof ice dam protection installed on your home’s roof during the initial installation of the roof can help to prevent this problem. If you notice water along outer edges of your home’s walls this may be a sign of roof ice dam formation on your home and should be addressed.